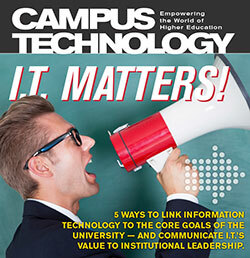 5 ways to link information technology to the core goals of the university — and communicate IT's value to institutional leadership. The best way to tackle users' bad security behavior is with a cybersecurity awareness program. The University System of Georgia is putting LMS data to work with predictive analytics. UC Irvine's Mimi Ito on building stronger connections between formal and self-directed learning. Southern Illinois U's Mobile Dawg program combines a tablet rollout with apps, digital content and services designed to directly impact student success. A homegrown adaptive tool is giving MOOC students coursework tuned to individual skill levels. Centers for teaching and learning share how they help faculty retool for tech-enabled learning.